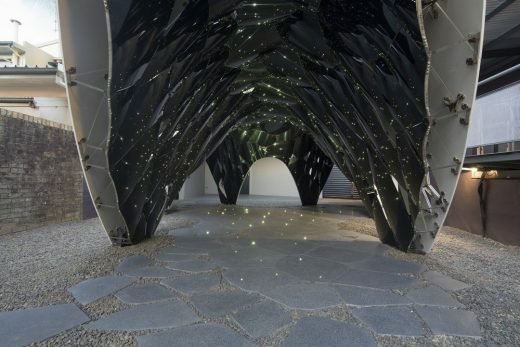 AR-MA’s pavilion Trifolium (2014), designed and built for the Sherman Contemporary Art Foundation’s (SCAF) annual competition Fugitive Structures, uses advanced computer design technologies to fulfil a research-oriented brief. 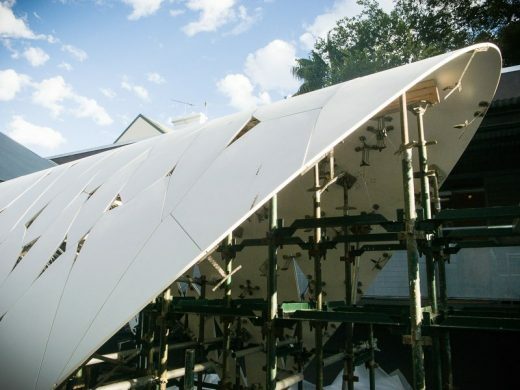 SCAF’s intent in driving the four-year, annually run pavilion competition, is to progress the integration of complex technologies, material or otherwise, in built structures. 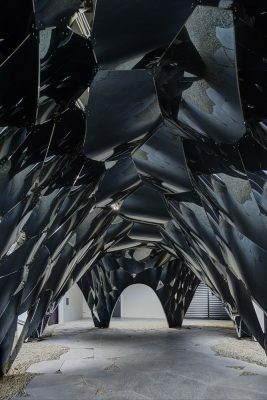 One amongst many entries, AR-MA was able to secure the commission through its dedication to progressive architectural methodologies and materials research. 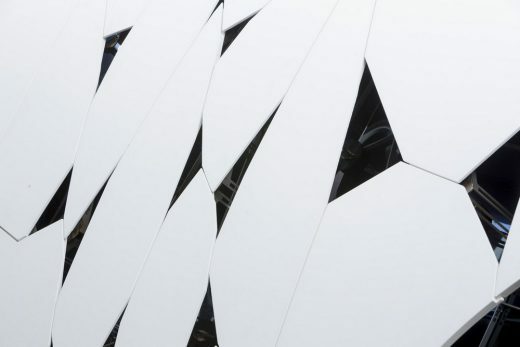 AR-MA’s answer to the brief was a three-leaved structure featuring a thermally-formed and robotically-trimmed, self-supporting Corian exterior envelope with 152 black, mirror-polished Rimex interior panels. 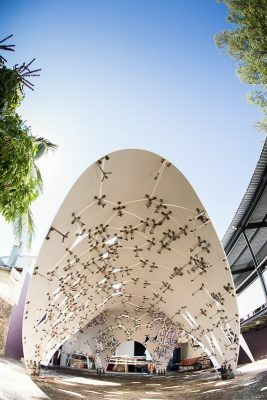 The two surfaces were connected with 452 unique stainless steel brackets, each fabricated to be self-jigging during the welding process. 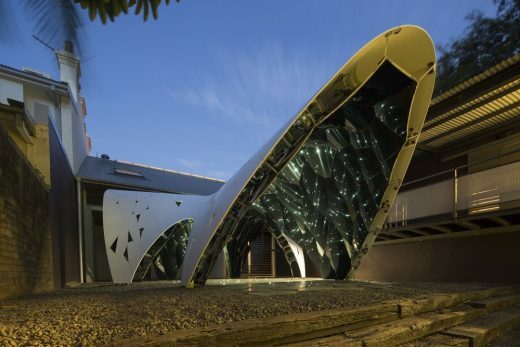 Conceived as a fluid, continuous event space, the internal space of the pavilion has the flexibility to be used as a meeting place or an auditorium, whilst the three leaves divide the external courtyard into a series of smaller, more intimate spaces. 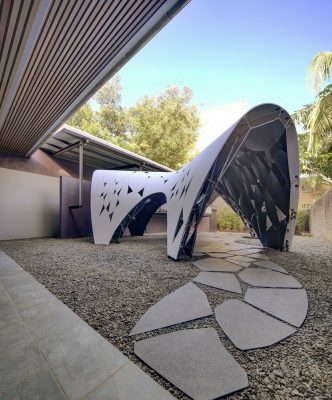 The reflectivity of the interior surfaces provides the connection between inside and out, reflecting the surrounding courtyard in a myriad of views. 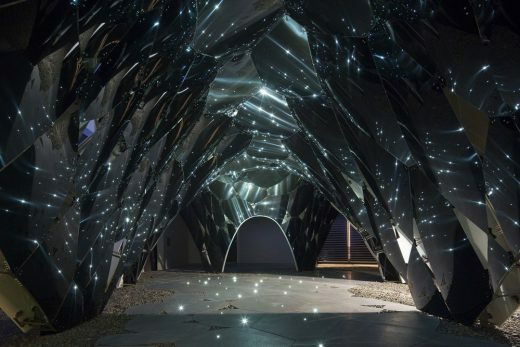 The position-sensitive play of light and image creates an affective relationship between the viewer and the pavilion, exaggerated as the sun sets and the 42 fibre-optic lights cast into concrete pavers reflect infinitely around the interior. 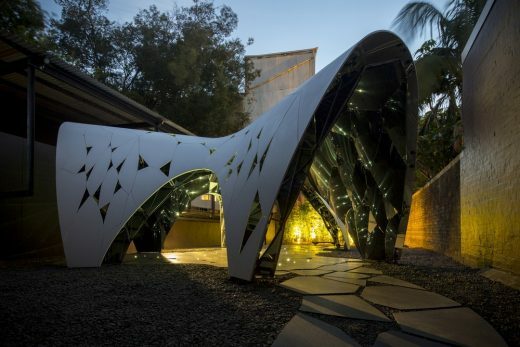 To execute a pavilion of such geometric and material complexity, AR-MA developed a series of custom scripts, plug-ins, and stand-alone programs to aid in modelling the structure. This is a feature of the project common to all of AR-MA’s output. 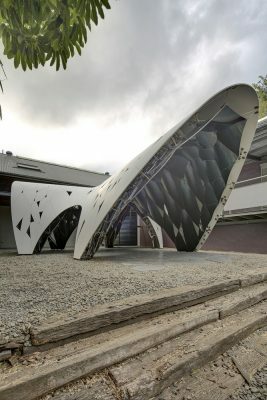 This software integrated geometric concerns with material and structural constraints to produce the form of the pavilion, and was ultimately linked to computer-controlled fabrication. 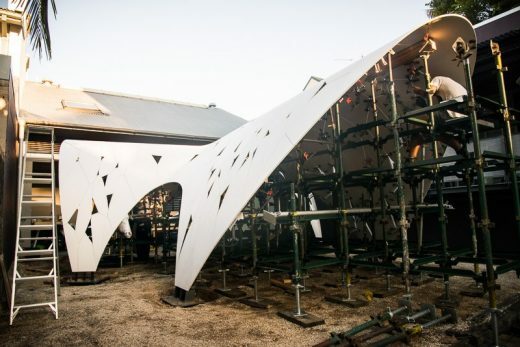 Fabrication of the pavilion took three months, and included digitally-integrated processes such as CNC-routing, laser-cutting, and thermo-forming. 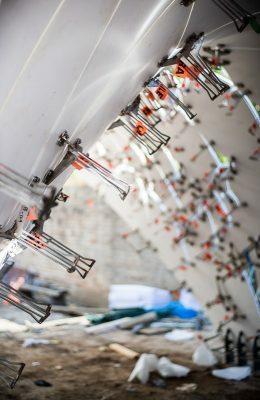 With over three-thousand unique pieces, the project became a logistical one of getting the right component to the right place at the right time.